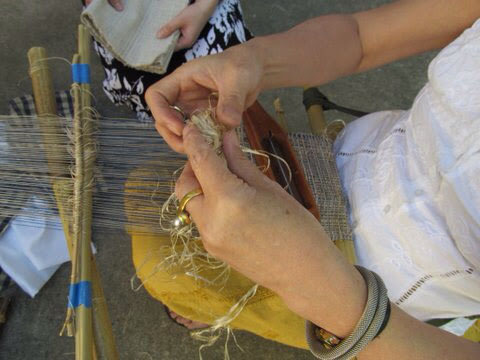 On April 26 and 27, 2014, Decatur’s Mingei World Arts Gallery owners, Ann VanSlyke and Ellen McFee, and TASA members Barbara Sherman and Junco Sato Pollack hosted a weaving demonstration by the Burmese Karen women. 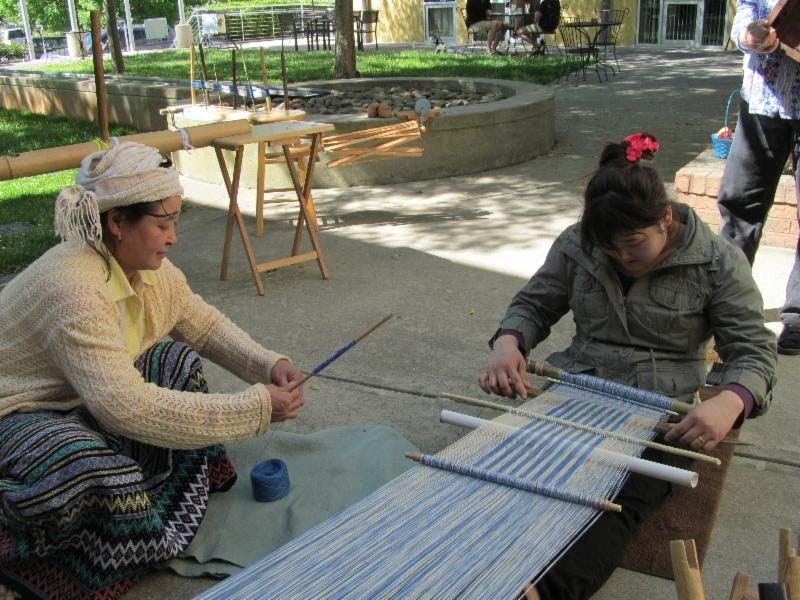 The refugee women set up their backstrap weaving looms, yarns, and market bags for sale in Mingei’s outdoor courtyard. Junco, who also answered questions about the future of this project, has worked with the women to create various marketable fabrics and products. The collaboration begins with Junco producing a design sketch with assigned colorways. Artisan Weaver Pa Taw produces one design from it and moves on to improvising and interpreting in the Karen style. She then creates individual warps and sends these to others to weave on their own looms. Junco accompanies Barbara Sherman on her weekly visits, to discuss colors, tools and techniques. The vision is ultimately to leave the designs and yarn selections up to the Karen weavers themselves as soon as they gain experience in the marketplace. The Karen Weavers Workshop (KWW) was established in 2013 by two women who are members of the Textile Appreciation Society of Atlanta (TASA), an organization promoting an appreciation of the textile cultures of the world. There are many thousands of refugees within the Atlanta metro area and Clarkston, Georgia, in particular. One very fine group of weavers, originally from Myanmar, is the Karen. The Karen women’s traditional weaving techniques and designs have been passed down for generations. KWW’s goal is to encourage support and preserve this wonderful cultural heritage. The Workshop also hopes to be able to provide a sustainable income for the weavers by marketing their products through the Women’s Cooperative at the Clarkston Community Center which believes that collaborating and marketing as a community will translate into success for all artisans.